The ground rules for customer relationship management have changed. Twitter, Facebook, LinkedIn and other social media platforms have made 2-way customer conversations an expectation. These online discussions affect your brand, customer service reputation and sales – you’ve got to listen, engage and respond quickly. Full social media engagement is a business essential and you need smarter contact management tools to crack it. Traditional CRM has become about workflow management of staff rather than enabling smart customer interaction. This lack of strategic vision has made traditional systems complex to use and install with a high cost of ownership. Do they actually deliver? Perhaps you get frustrated that you can’t access information quickly enough, or you spend ten minutes after a phone call updating the database for no apparent gain. Accurate customer contact details must be at the core of any CRM. It’s no longer enough to collect a name, address, phone number and email – you also need Twitter, Facebook, LinkedIn and Google+ profiles. Wouldn’t it be easier to engage customers if you could keep tabs on what important contacts were saying by email AND on social media from one area? 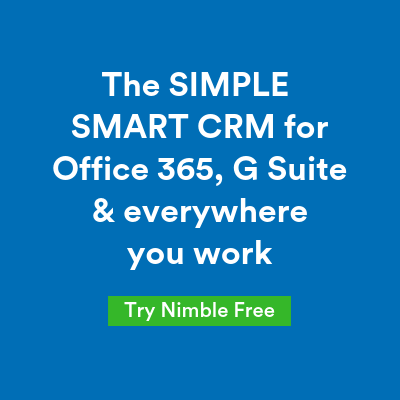 Before you look to add this important functionality to your existing solution, you might be interested to know social CRM systems like Nimble are designed to do just that. With Nimble, you create a consolidated list of all your contacts and gain the ability to follow your customers’ social media and email conversations all from one place. This increases your mind-share and in-turn profitability. You’ll find Nimble is cost effective and easier to implement than traditional systems like GoldMine, Salesforce or Highrise. That’s because Nimble strips away all the expensive ‘nice to haves’ and as it’s a cloud solution, you also avoid costly consultants’ fees. Instead it delivers the capability you need, and can be quickly integrated with MailChimp and HubSpot, should you need extra functionality or closed loop marketing. Easy to use: With user experience at its heart, Nimble is simple to use and quick and easy to update. No expensive training courses are required! A unified inbox: From a single view see all communication you’ve had with customers across email and social media platforms. Consolidated contacts: View your contacts with their related social profiles for a single view of what’s happening. Social monitoring: See what’s being said across all platforms and then engage from one screen. Gain market share by click ‘import’ of key influencers, then land and expand by engaging with their followers. Avoid lengthy implementation and costly set-up fees: Nimble costs just $15/month for each user. You’re up and running immediately, just connect your social accounts and start engaging now. If you think a consolidated contact list could improve your customer relationship management, simply click the button below and explore Nimble today.